The first step is to place the rocket-powered descent stage on top of the surrogate rover (the real rover is being integrated and tested in tandem with the spacecraft stack). Then, when all the holes line up and everything is attached, checked and re-checked again, the back shell is lowered over them via gantry crane. 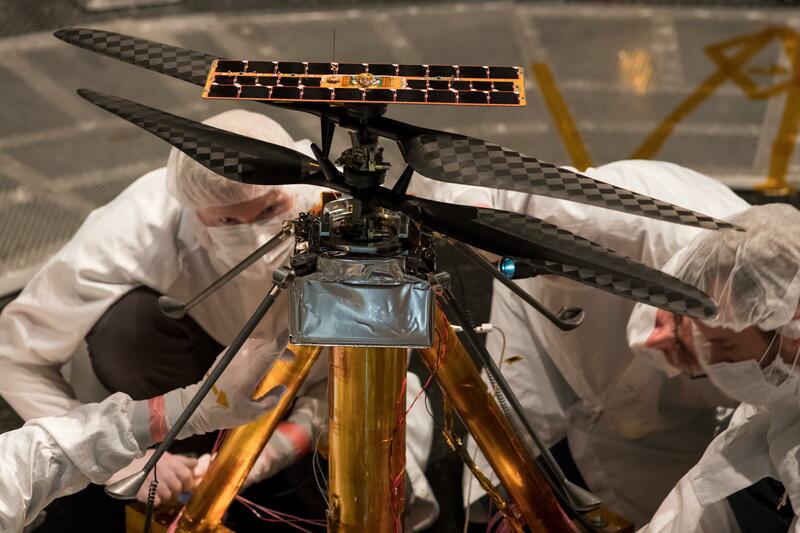 The US space agency, NASA, has announced that its Jet Propulsion Laboratory (JPL) will be sending a helicopter to the Red Planet on the upcoming Mars 2020 rover mission. It will land on Mars while attached to the bottom of the rover in February 2021. During the first 30 days of the mission, it will undertake several autonomous flights, each lasting up to 90 seconds to send the first aerial images (not taken by a satellite) of Mars back to Earth. For the small helicopter to fly, it takes an enormous engineering effort. The thin air on Mars is comparable to conditions on Earth at an altitude of 30km. Also, taking the reduced Martian gravity into account, the helicopter needs to be very light (1.8kg) and can only carry small batteries. The components used therefore must be extremely energy-efficient. Six of maxon motors’ 10mm diameter DCX precision micro motors, which have been used in previous Mars missions, will be used to move the swashplate, adjusting the inclination of the rotor blades, to control the vehicle. The propulsion system is designed and built by AeroVironment, working closely with maxon engineers, under contract from JPL. “Being part of another Mars pioneering project makes us incredibly proud,” says Eugen Elmiger, CEO of maxon motor. This high-definition image was taken on Sept. 7, 2018, during the third and final test flight of the ASPIRE payload. It was the fastest inflation of this size parachute in history and created a peak load of almost 70,000 pounds of force. In the early hours of Sept. 7, NASA broke a world record. Less than 2 minutes after the launch of a 58-foot-tall (17.7-meter) Black Brant IX sounding rocket, a payload separated and began its dive back through Earth’s atmosphere. When onboard sensors determined the payload had reached the appropriate height and Mach number (38 kilometers altitude, Mach 1.8), the payload deployed a parachute. Within four-tenths of a second, the 180-pound parachute billowed out from being a solid cylinder to being fully inflated. It was the fastest inflation in history of a parachute this size and created a peak load of almost 70,000 pounds of force. This wasn’t just any parachute. The mass of nylon, Technora and Kevlar fibers that make up the parachute will play an integral part in landing NASA’s state-of-the-art Mars 2020 rover on the Red Planet in February 2021. 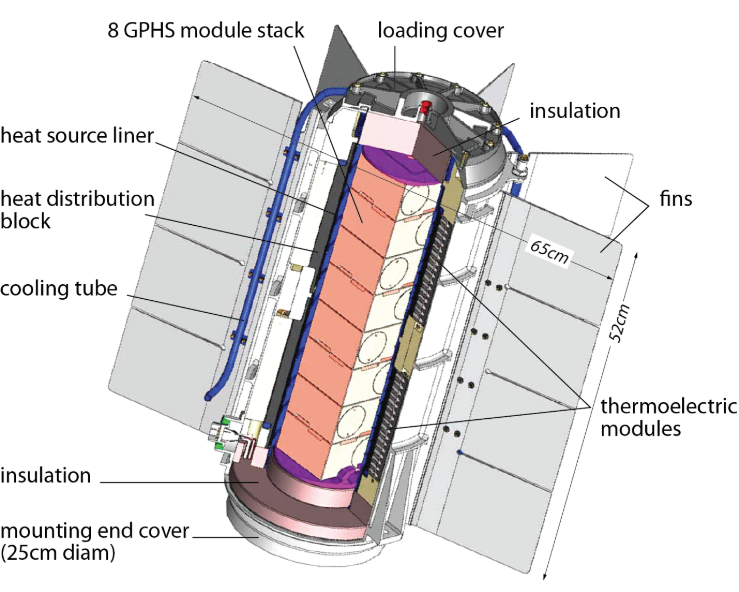 The Jet Propulsion Laboratory’s Advanced Supersonic Parachute Inflation Research Experiment (ASPIRE) project conducted a series of sounding rocket tests to help decide which parachute design to use on the Mars 2020 mission. Two different parachutes were evaluated during ASPIRE. The first test flight carried almost an exact copy of the parachute used to land NASA’s Mars Science Laboratory successfully on the Red Planet in 2012. The second and third tests carried chutes of similar dimensions but reinforced with stronger materials and stitching. On Oct. 3, NASA’s Mars 2020 mission management and members of its Entry, Descent, and Landing team met at JPL in Pasadena, California, and determined that the strengthened parachute had passed its tests and was ready for its Martian debut. The Mars 2020 Rover: This artist’s rendition depicts NASA’s Mars 2020 rover studying a Mars rock outrcrop. Image credit: NASA/JPL-Caltech. Hundreds of scientists and Mars-exploration enthusiasts will convene in a hotel ballroom just north of Los Angeles later this week to present, discuss and deliberate the future landing site for NASA’s next Red Planet rover – Mars 2020. The three-day workshop is the fourth and final in a series designed to ensure NASA receives the broadest range of data and opinion from the scientific community before the Agency chooses where to send the new rover. The Mars 2020 mission is tasked with not only seeking signs of habitable conditions on Mars in the ancient past, but also searching for signs of past microbial life. The landing site for Mars 2020 is of great interest to the planetary community because, among the rover’s new medley of science gear for surface exploration, it carries a sample system that will collect rock and soil samples and set them aside in a “cache” on the surface of Mars. A future mission could potentially return these samples to Earth. The next Mars landing, after Mars 2020, could very well be a vehicle that would retrieve these Mars 2020 samples. 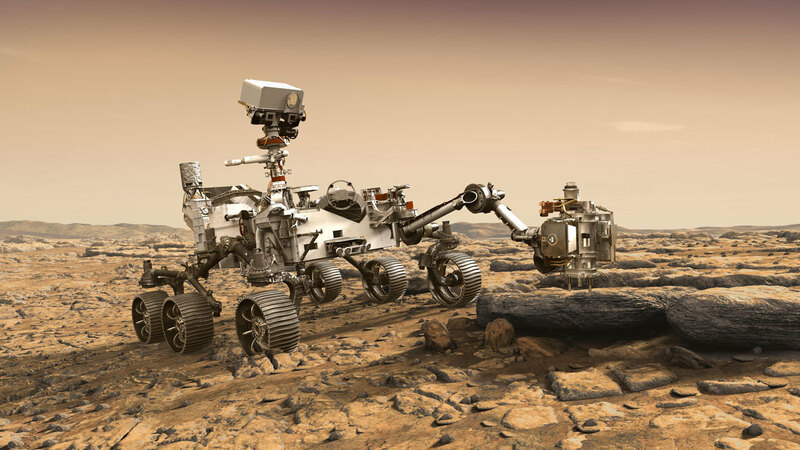 Aerojet Rocketdyne, in collaboration with Teledyne, recently delivered the electrical power generator for NASA’s Mars 2020 rover to the U.S. Department of Energy’s (DOE) Idaho National Laboratory (INL), where it will be fueled, tested and readied for flight. In addition to providing the primary power source for the rover, Aerojet Rocketdyne is also playing a critical role in spacecraft propulsion for the journey to Mars. A Southern California company that specializes in small drones for the military has an opportunity to contribute to aviation history: the first aerial flight on Mars. AeroVironment Inc. is making the rotors, landing gear and material to hold solar panels for the Mars Helicopter project, which will be assembled at NASA’s Jet Propulsion Laboratory in La Cañada Flintridge. The device will deploy from NASA’s latest Mars rover in 2020, taking high-resolution images that can determine where the slower-wheeled vehicle should head next. The drone helicopter will look somewhat similar to a hobbyist device you might see whiz by on the beach. But it will incorporate years of research into the challenges of flying in a thin atmosphere that has similar density to about 100,000 feet above Earth’s sea level. Excitement has been building for NASA’s next rover mission to Mars, scheduled to launch sometime in 2020. Although it looks a lot like the current Curiosity rover, its mission will be to search directly for possible evidence of past life. Curiosity, on the other hand, is studying the ancient habitability of Gale crater, which we now know used to hold a lake or series of lakes, focusing more on geology than biology. And now the upcoming 2020 mission just got even better – NASA has approved the inclusion of a tiny drone-like helicopter to accompany the rover! This is something never done before, and assuming it’s successful, will be the first time that Mars has been robotically explored by something other than an orbiter, lander or rover. The Mars Helicopter will be a small, drone-like autonomous rotorcraft, designed specifically for Mars’ very thin atmosphere; it will provide a unique and exciting new way to see the Martian landscape as never before – a bird’s-eye view, if you will. And of course, it’s just very cool.